If you want to combine fishing and camping in a stunning setting without having to drive too far from Vancouver, then Sasquatch Provincial Park might just be your best option. Just two hours of driving from Vancouver, Hicks Lake in this provincial park offers fishing for two trout species - Cutthroat trout and rainbow trout. Both shore and boat fishing are available. With nearby hiking trails, campsites and picnic areas, one cannot ask for anything better when it comes to a real outdoor experience for young families. Hicks Lake is in Sasquatch Provincial Park. Travel time from Vancouver by car is roughly two hours. To get there, travel on either Highway 1 or 7 to Harrison Hot Springs. From Harrison Hot Springs, travel along Rockwell Drive, which leads to Sasquatch Provincial Park. Follow the signs in the park to Hicks Lake. Park at the day-use area if you are just fishing for the day, or continue to the campsites for registration if you are camping. Two trout species are stocked in Hicks Lake by the Freshwater Fisheries Society of BC. Rainbow trout are released at catchable size (200 - 300g) while cutthroat trout are released in the 50 to 150g range. Stockings take place in spring and fall. Fishing is available from late spring to early fall. June and July are the best months. Shore fishing is available directly in front of the day-use and camping areas, which is perfect for kids. The shoreline has access to deep spots where trout are found. Spin fishing is best from shore as there is not much backcasting room for fly fishing. You can either bait fish with a float, or spincast with small lures. Productive bait include dew worm, krill, deli shrimp, salmon eggs. Bubble float with a fly can also be great if fish only feeding on insects. A small boat can get you to spots with less fishing pressure, therefore fishing results might be better. You can troll a fly, which is always enticing to trout. A small leech pattern, size 8 to 12 in olive or brown, should work very well. Anchoring and suspending a chironomid can also be very effective. Most of the fishing activities take place in the small bays and islands near the day-use area, at the north end of the lake. The southern end of the lake is quite open and can get very windy at times. Because these fish normally do not grow much bigger than their stocking weight, it is more enjoyable to fish with light tackle. 4lb test is adequate enough on a spinning outfit, while a fly rod rated 3wt or less is best. 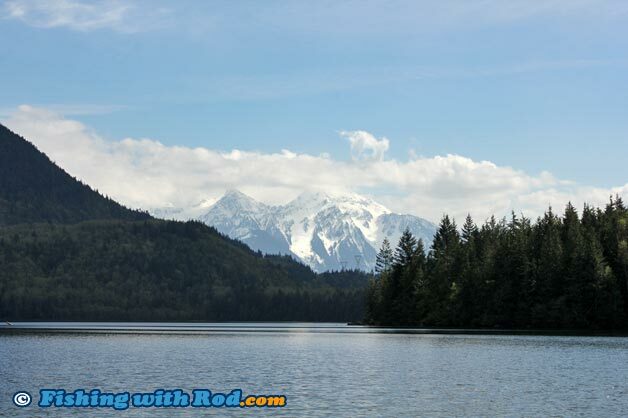 Hicks Lake is located in Region 2 in the British Columbia freshwater fishing regulations. Hicks Lake is in a provincial park, so please be aware of park rules and respect other users and wildlife.